← Conclave has begun, so cast your votes! where logging trucks skirt our boggy lagoon each day and night. loaded with cargo, heavy with sky. as dark bodies spotted through ice. Ghosts come out in all the hours. Bad things hide inside the coal shed. Nose pinched with chill, I huff white clouds at it. At the path’s edge grasses stand, stiff as green twigs. There’s a frozen puddle in the mud. I press the tip of my gumboot down, testing strength. or the man with no pants will get you. or the rain will come wash you away. They say the man at the top of the lane was blinded in one eye by a possum. I don’t much like him anyway, because of his smell. Darker than the cave I make inside my bed at night. to grovel in the black. I crawl through the drain pipe beneath the main road. Across the lagoon, through the teeth, and flying. Faster than ships, out of the fog. The poem was published in the Kiwi Diary 2014, and is based on true things. 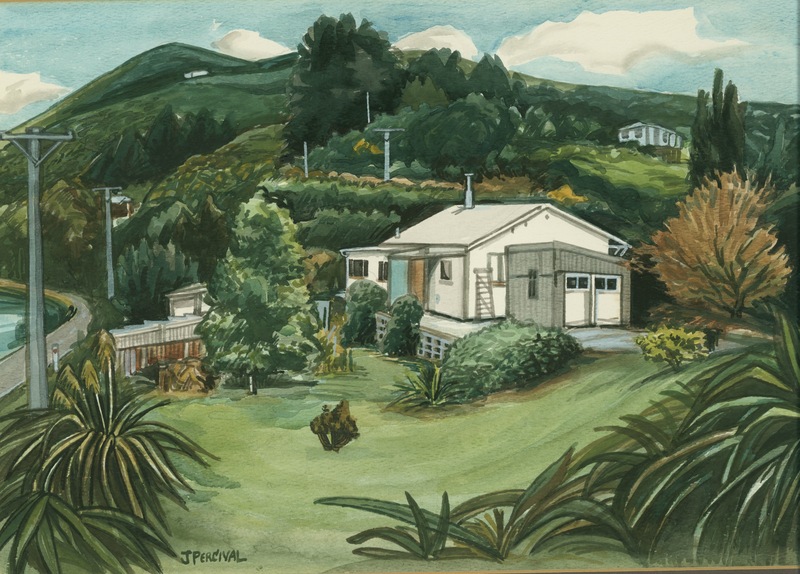 The painting is of the house where I grew up. Painted by my Mum, who sent all of us out to fetch coal.